WHAT DOES ‘DRIVE’ INTO THE GROUND MEAN? The manufacturers know that distance sells. They appeal to our vanity and our desire to hit the golf ball further. I’m all for the argument that you want to get as far as possible off the tee (with reasonable accuracy and consistency); that closer to the hole, the less club you are going to have to take. But for most golfers from #6 Iron in, the difference between Irons should be measured in terms of accuracy, not distance. When you look at the table to the right you can see that measuring the distance different brands’ #6 Irons can be hit, seems unreasonable anyway. What is a #6 Iron with one brand is a #5 Iron with another.That is a ¾” difference between the length of shaft in Brand A and Brand C, despite the fact that from a loft perspective these appear to be the closest #6 Irons amongst the group. If we are going to place a focus on your #6 Iron, then before we get too excited about anything else, we need to get the right shaft length and lie angle, along with the right shaft type and grip size. Get those right and you’ll have a better chance of hitting the sweet spot, square to the target. That is what you want from your Irons, so click here to book your custom fit today and start playing better golf. 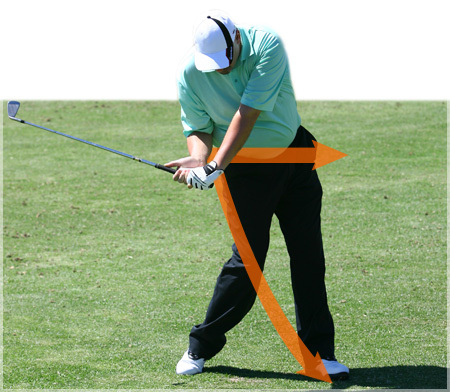 If you haven’t made a proper shoulder turn with the correct hip movement, then any advice on the transition to the downswing will be ineffective. “Driving into the ground” is not going to get the body into the correct position! But the intent of this guidance is good. If we can get you to start the downswing correctly (from the top of the backswing) then golf gets a whole lot easier and you will hit it further. Make it your mission to improve your golf swing by first getting into the correct position at the top and then starting down correctly. Come and see us and let us help.